Toilolo was targeted once during Sunday's 28-14 loss to Seattle, converting it into a 12-yard gain. 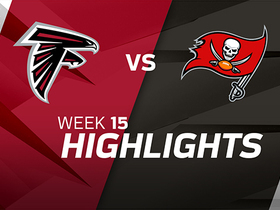 Toilolo secured his only two targets for 12 yards during Sunday's 26-24 loss to the Cowboys. 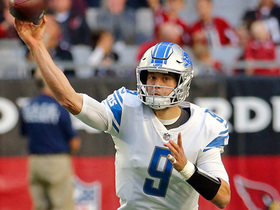 Analysis: It's clear the Lions value Toilolo for his blocking ability, as the tight end previously went two weeks without a target since catching one pass in the season opener. Unless injuries force him into a bigger receiving role down the line, Toilolo subsequently belongs far away from fantasy lineups in almost all formats. Toilolo logged 22 snaps but was not targeted during Sunday's 30-27 loss to the 49ers. 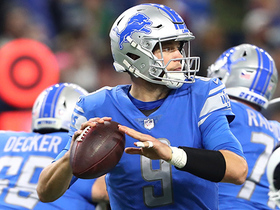 Analysis: Unlike last week when he earned the most snaps among Lions tight ends, Toilolo took a clear backseat to Luke Willson, who started and logged 40 snaps Sunday. As usual, Toilolo wasn't often used as a receiver when he was on the field, but that's largely been the story of his career to date, and it's unlikely to change anytime soon. 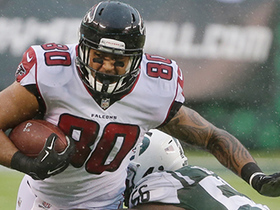 Toilolo secured his only target for seven yards during Monday's 48-17 loss to the Jets. 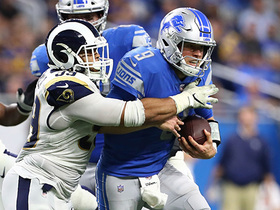 Analysis: He didn't get the starting nod, but Toilolo ultimately paced all Lions tight ends in snaps -- though he was mostly utilized as an in-line blocker. While Toilolo could continue to log significant playing time, he's only topped 13 receptions in a season once in his five-year career, lending no reason to count on him for fantasy purposes. The Lions agreed Wednesday with Toilolo on a one-year contract, Jeremy Fowler of ESPN.com reports. Toilolo will be released by the Falcons, Ian Rapoport of NFL Network reports. Analysis: Toilolo signed a three-year, $12 million contract last offseason, but the structure of the deal meant his status with Atlanta was still a year-to-year proposition. The 26-year-old tight end caught 12 passes on 421 offensive snaps in 2017, stuck behind Austin Hooper on the depth chart all season. Toilolo doesn't offer much as a receiver and likely will have to settle for backup work elsewhere. 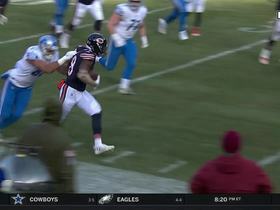 Toilolo caught one of two targets for 12 yards in Saturday's divisional-round loss to the Eagles. 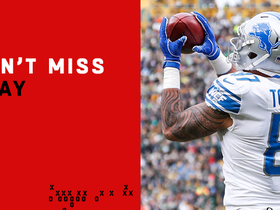 Analysis: Toilolo had a bigger impact in the real world as a blocker than he did as a fantasy option in 2017, as he finished the year with 12 receptions for 122 yards and one touchdown. He's under contract for two more years, but Austin Hooper is the Falcons' tight end to own of the duo. 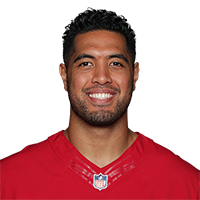 Toilolo (knee) does not have an injury designation for Saturday's wild-card matchup with the Rams, Vaughn McClure of ESPN.com reports. Analysis: Although he has been limited in practice all week, Toilolo did not receive an injury designation for Saturday's game, meaning the tight end should be all set to go. Toilolo averaged over 28 offensive snaps per game during the regular season, but there's no telling if the lingering knee injury will whittle down those numbers. 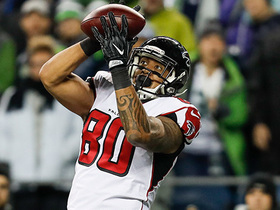 Toilolo (knee) practiced on a limited basis Tuesday, Kelsey Conway of the Falcons' official site reports. Analysis: Toilolo sat out Week 17 with a sprained MCL, so an appearance in the first practice of wild-card prep is a step in the right direction for the reserve tight end. When active this season, he received at least 40 percent of the offensive snaps in 11 of 15 games, but his final stat line (12 catches for 122 yards and one TD on 14 targets) doesn't inspire much confidence in the fantasy realm. Toilolo (knee) has been ruled out for Sunday's game against the Panthers, D. Orlando Ledbetter of The Atlanta Journal-Constitution reports. Analysis: The sprained MCL that Toilolo suffered in Week 16 will keep him out of the season finale, while if the Falcons make the playoffs with a win Sunday, it's unclear if he'll be able to participate. Eric Saubert will slot into the No. 2 tight end role in Week 17. Toilolo (knee) didn't practice Thursday, Vaughn McClure of ESPN.com reports. Analysis: While Toilolo's back-to-back absences from practice to begin the week aren't encouraging, Falcons head coach Dan Quinn said that the tight end's MCL sprain isn't viewed as a long-term concern, per D. Orlando Ledbetter of The Atlanta Journal-Constitution. As a result, Quinn said Toilolo still has a chance at playing in Sunday's regular-season finale against the Panthers, though the 26-year-old will likely have to practice in some capacity Friday in order to have a realistic shot. Toilolo (knee) won't take part in Wednesday's practice, Kelsey Conway of the Falcons' official site reports. Analysis: The backup tight end sustained an MCL sprain in Sunday's loss to the Saints and looks unlikely to play in the regular-season finale against the Panthers. Toilolo will probably need to put in two limited practices or at least one full practice over the next two days to change his outlook on the health front. Toilolo (knee) has a sprained MCL, Ian Rapoport of NFL Network reports. 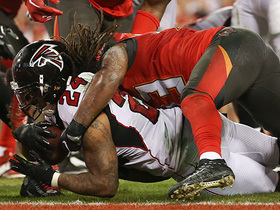 Analysis: It's unlikely he will play in the Falcons' regular-season finale versus the Panthers. If he can't make it back in time, it might mean an extra target or two for Austin Hooper. Eric Saubert would fill in for 26-year-old. 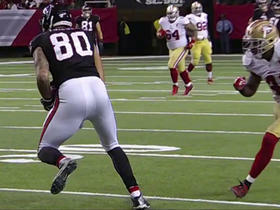 Toilolo (knee) didn't return to Sunday's game at New Orleans, William McFadden of the Falcons' official site reports. Analysis: While deemed questionable to return to the contest initially, he wasn't able to make it back. He'll likely enter Week 17 with the same tag as the Falcons prepare to take on the Panthers. Toilolo injured his knee and is considered questionable to return to Sunday's game against the Saints, Kelsey Conway of the Falcons' official site reports. Analysis: The severity of Toilolo's situation isn't clear. Austin Hooper will be the Falcons' only other option at tight end for the remainder of the game with Eric Saubert (coach's decision) inactive Sunday. Toilolo caught two balls for 25 yards in Sunday's 14-9 loss to the Vikings. Analysis: The Falcons only managed 173 yards through the air, but Toilolo has rarely contributed as a pass catcher this season, accruing 13 targets in 12 games to date. Week 14 won't be any easier against a Saints defense that has conceded 3.3 catches per game to tight ends this season.